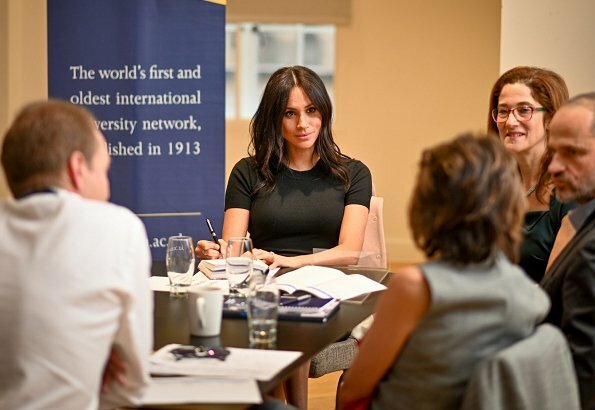 The Duchess of Sussex visited King's College London on Wednesday to address important issues including human trafficking and modern slavery, gender equality and inclusion, peace and reconciliation, and climate change and resilience. The event was held at King's College for the ACU (Association of Commonwealth Universities), an inter-university network for schools across the British Commonwealth. Serious look for a meeting on a very serious topic. If her hair was any more "controlled" it would be helmet. I swear people want royals to have hair like mannequins, and not like anything that grows naturally from a human head. She looks nice in black and paired with something light pink (from the back of the chair) either jacket or coat is a nice combination. Her hair is rather messy for me. I wish she would have taken more time to style it. Human trafficking and modern slavery are such important issues today!! Thankfully we have moved on from concrete hairsryles to natural hairstyles. She looks good to me. What's concrete hairstyles? Didn't her hair looked lovely, and professional, on their Irish visit, when she had a bun on the side of her head? Not agree, she looks very good. Not agreed either, she looks young and fresh and interested. Gabriella is almost always negative, no matter whom she is speaking of. Anon 4:15, I consider a concrete hairstyle one like Princess Anne's. It is old fashioned, never changing, and sprayed into place so it never moves--like a helmet. I really like fresh, natural, free-moving styles. Nice top or dress from what ever one could see. But the hair is a mess, Makeup is fine. So, is she ever going to become a patron of a charity? Or is she just going to "visit" places and discuss topics? I believe Kate had already become a patron within the first few months after marrying. I don't think that's quite true, Natasha. The earliest patronages I could find for Kate were January 2012, nearly 10 months after her April 2011 wedding. Meghan married in May. If we give her the same 10 months Kate got, then she has until February 2019. Reports this week say that her charities will be announced in January, though. To me she looks much younger than her age (and 10 years younger than Kate), (her mom DNA helps her), very pretty, and very confident. I really hope that the rift story between her and Kate is not true. I hope she is accepted by Kate and jealousy and competition is not a factor for neither of the girls. But I saw Harry looking at Kate differently in their last appearance together. He gave her an intense look almost an angry one....it was not his usual look of admiration towards her as we were accostomed to see....so there could be some truth to it. Harry is looking grumpy at everyone, not just Catherine, which he has said in the past that she is the sister he never had. I have noticed Harry's scowls on his face since his marriage and I don't think Catherine has anything to do with it. Time will tell what is going on in his marriage or his relationship with other members of the Firm since his marriage. I have my ideas of what is going on, but this isn't the place to air them. Also, Meghan hasn't had three pregnancies and now three kids to keep up with. Lets see how young Meghan looks after three kids (if she has that many). Nothing about fashion here, but did she not had the time to style her hair a little bit? She is representing the Saxe-Coburg-Gotha's, isn't she? And it is always a nice matter of respect to the people in front of you, if you are looking sophisticated. I think the name Saxe Cobourg Gotha is NO LONGER applicable to the British Monarchy; it was officially changed in 1917 to become the Windsor. Mary T, just a joke. Of course I know. Anonymous 6:05AM, I appreciate your factual response. She looks nice and concentrated. Black is great colour for her and I like her hair. Meghan is 'only' a duchess/princess in rank... Kate is a future queen, it makes a difference in all monarchies! She will always be number two in status and protocol (as Harry is). That‘s exactly the sting in Harry‘s flesh - he will always be ‚the spare‘ like his mother said. For my oppinion his sometimes problematic behavior - he always needs a lot of attention -is not only a consquence of a childhood trauma. Not an easy task for Meghan, hopefully she will find her role. I think that's where this supposed feud is stemming from. Megan was under the impression that she'd be a lot more important in the pecking order. She didn't realize that the royal family takes their rank seriously.And Harry is acting petulant and expected everyone to "roll out the red carpet" which is what that article in the Daily Mail said. With so many stories about Megan's behavior, it's hard to think there's not a sliver of truth to some of it. Like the old saying goes..where there's smoke, there's probably a fire. Seems to be true, I'm disappointed from Catherine. What does she think makes her better? Agree with monty, Prince Harry is lovely guy and. Blair; that "where there´s smoke, there´s probably a fire" is saying I probably hate most in life. That justifies all the bullying and harassment possible, both in real life and internet. There really does not need to be even a hint true but all the burden to prove the talk nonsense goes to victim. Because there is always the truth as some believe, how ever imaginative story has been told. Not to mention how many teenages end to suicide when they do not have strength to prove they are innocent. The stories Daily Mail have told are mostly from "unnamed sources" what can be just after what good imagination of yellow papers journalists hint in story. Prince William and Catherine payed a lot of attention to Harrys problems but they also have to draw a line. After all he‘s grown up and married. And again: hopefully Meghan finds her role, she isn‘t a second Catherine or Diana. Meghan is intelligent, actually a good condition to succeed in the company - if Harry lets her. Agree with Blondiini about persecution respectively everyone can be persecuted innocently. Bullying and harrasment in kind of "harmless" gossip is paid though not good. I apologize for my English, hope it is clear what is intended. Agree to monty, who is saying "if Harry lets her" - yes he is needs a lot of space and is a probably a young soul with his heart in the right place. Blondini, please don't try and twist my comment around. I am in now way trying to justify or persecute anyone. Of course you shouldn't believe everything you read or hear. With so many stories written to cause scandal and gossip, only half of them are true. Only time well tell about this supposed feud. Blondiini, your comments are well expressed. Harry has been very vocal about "no one wanting the job" of being king, and I think he is probably fine with where he is. He has a lot of major changes in his life this year, and it is horribly unfair for a lot of strangers to try to read anything into his decisions or the gossip that is reported. I just wish them all the best during this time of change and adjustment. Blair; we have also saying "That dog yelps, which the stick hits." So, if I understand correctly, here some obviously "non-fashion" comments about Meghan and Kate are tolerated without any negative reaction. In today's article about the Spanish royals, just one little such sentence about Letizia was immediately turned down by a blogger. That is strange to me. Where do you see NewMyRoyals is just a fashion blog? It's so much more,we get plenty of information about their events …… Thanks to Hellen Electra for that (a great job) ! During years nasties comments ever have been all against Catherine. Meghan seems to be open game as well. Swedish Sophie the third. die hebben mee gemaakt ,niet normaal 1! !maar ALBRT heeft ze goed in gelicht!!!! Reine ou pas Reine duchesses ou pas duchesses c’est toutes des roturières pour moi elle sont au même niveau !!!!!!!! Thank you to Hellen Electra for outstanding engagement, pushing the blog forward by the posibility of some clarifying words in setting attitudes on respecting diversity of opinions. I'm a bit late to this conversation! I've thought for along time, that H&M world wind romance, would come up against the odd hiccup. Kate grew up in the UK and had a strong understanding of how it works, much like most of us on the outside looking in. She also had the years of courting William and so, had those years to come to terms with protocol. Meghan has not had the same luxury. She probably thought, as she stated in her engagement interview, that the title would give her a bigger platform to carry on her good causes. I think, she's finding the rules and protocol a little suffocating, and is struggling to adapt to palace life. I hope that the rumours of a divide is just teething problems and not as reported down to Meghans attitude, because you can bet your bottom dollar, the Brits won't take to anyone being 'upperty', just look at how Princess Michael was treated by the media ! I for one hope the move to Windsor and the arrival of the new baby/babies (!) will give Meghan a solid grounding and time to adjust to the rights and wrongs of royal life !